Saba I. brings us news from Gerard Butler’s new movies, Ewan McGregor in Toronto, Angus Macfadyen in LA, Henry Ian Cusick as Charles Darwin and more, in her new regular feature “This week in Scottish Entertainment /Actor News”. We now have official word that Ewan will attend the Toronto International Film Festival to promote The Men Who Stare At Goats. His co-star George Clooney is also scheduled to attend the festival. The festival will run from September 10 to September 19. Kevin McKidd has signed on for Infinity Ward’s next Call of Duty game. Call of Duty: Modern Warfare 2 is predicted to be the best-selling console game of all time. The news of Kevin McKidd’s involvement with “final voice work” for the game was announced via Infinity Ward director of communications Robert Bowling’s Twitter. McKidd was also the voice of Jezz Torrent in Grand Theft Auto: Vice City. Got these photos from Henry Ian Daily from Darwin’s Darkest Hour which will air on PBS on October 6. Whoa, Charles Darwin is dreamy. Annette Bening will star alongside Scottish actor Angus Macfadyen in the world premiere production of Medea. 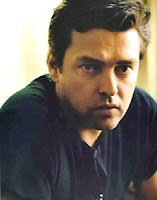 Angus Macfadyen will play Jason while Bening will play his ex-lover, Medea. The show will run at UCLA Live’s Freud Playhouse from September 18 to October 18. Opening night is September 23 and tickets are on sale at www.uclalive.org and at the UCLA Central Ticket Office (310-825-2101), and at all Ticketmaster outlets. You can check out the UCLA Live website for more information.  Archived in Film, Scottish Entertainment / Actor News and tagged Angus Macfadyen, Craig Ferguson, Ewan McGregor, Gerard Butler, Henry Ian Cusick, Kevin McKidd, Scotland, Scottish, video. Bookmark the permalink. thanks for the gerry pics . u just made my day.